Quail Ridge, FL: Invites you to stay, golf, dine, tour community. > Quail Ridge Golf & Country Club, Boynton Beach FL extends an Invitation to Stay & Play, and enjoy club activities and amenities just as members do. The package is $399 per couple, $299, single. A community tour and preview of available homes will be scheduled. This package includes, for each person, three nights lodging in a spacious condominium, two rounds of golf, $100 dining credit and use of the Fitness and Tennis centers and swimming pool. No extra charges for gratuities and taxes. Send me more information about Quail Ridge! WindRiver, TN: St. Patrick’s Day festival March 16. > WindRiver, Lenoir City TN is gearing up for its traditional “St. Pat’s Irish Fest,” happening on Sat., March 16 from 5 to 9 pm at Citico’s at WindRiver. The evening will feature an Irish buffet, Irish cocktail and beer specials, full bar, festive games and live music with the Jay Eric Band. Tickets are $35/person, covering dinner and the entertainment. Festive attire is encouraged. Send me more information about WindRiver! Palmetto Bluff, SC: Offers training for marathon. > Palmetto Bluff, Bluffton SC continues its monthly series of group training sessions for the community’s upcoming Palmetto Bluff Marathon, Half Marathon & 10K, which is scheduled for Sun., March 10. On Sat., Feb. 16 all residents are invited to take part in a “Rise & Run” event, setting off from RT’s Market at 8 a.m. for a run through Wilson Village. Admission is free. 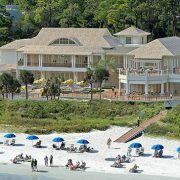 Send me more information about Palmetto Bluff!